Judges comment: "good to see a band singing in a regional accent, sax and trombone worked well. Good unit and good front man." 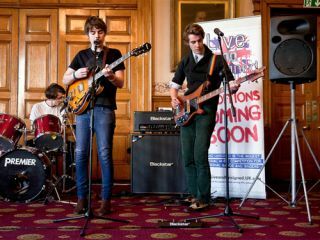 The first batch of Live and Unsigned 2011 auditions took place last weekend in Basildon, Cardiff and Dewsbury, with over 900 acts battling it out for a place in the regional final showcase. As a way of providing useful feedback, Live and Unsigned have posted a selection of the judges comments - you can check out Cardiff's and Dewsbury's now, with Basildon's promised for later today. And watch this space for videos of some of the opening weekend's best acts. The next auditions take place on Saturday 22 January at the Beck Theatre, Hayes, Middlesex and on Sunday 23 January at Sheffield City Hall, so if you haven't applied yet, don't hang around! Oh, and congrats if you're already through to the next round, we'll see you there. Judges comment: "one of the best harder bands of the day, love the music breaks." Judges comment: "great original material and really fun voice."